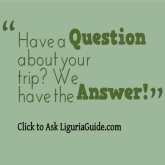 We hope the information on LiguriaGuide.com was of great value to you. We are in love with Liguria and we are simply sharing our affection for this beautiful Italian region with you. Visit Liguria and we are sure that you will fall in love with it too. After you do, please come back to our site and share your Liguria Travel Stories with us. This is one of our favourite corners of the site where you share your best Liguria experiences with everyone... Liguria stories, tips, discoveries, must-do's, etc. 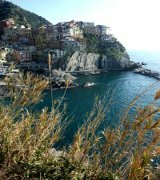 Liguria travellers just love reading about the adventures and explorations of others. In the meantime, we will continue working on bringing you up-to-date information on Liguria and the best offers available for a perfect vacation. If you have any ideas, suggestions, comments or questions, please feel free to contact us by using the form below. Your privacy will be valued and we will not use your details for any other purposes other than to contact you if your message requires a reply. For accomodation availability requests (even if you haven't decided on the exact accomodation) please use our Check Availability form. We get much correspondence, so please allow us at least 2 business days to respond to your message or request. Such a great website ! Thanks for such a great website with lots of useful information (e.g. receipts - I would not have known!) I'm looking forward to visiting!